Professor Stein obtained his B.Sc. degree in chemistry at the University of Calgary in 1986 and carried out his graduate work with Professor Geoff Ozin at the University of Toronto, specializing in the synthesis and characterization of zeolite materials. After earning his Ph.D. degree in 1991, he joined the Advanced Inorganic Materials group at the corporate research labs of Bayer A.G. in Germany as an NSERC postdoctoral fellow, followed by postdoctoral research with Professor Tom Mallouk at both the University of Texas, Austin, and at Penn State University. 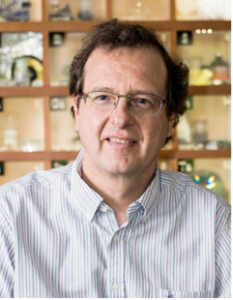 In 1994 he joined the faculty at the University of Minnesota, where he is now a Merck Professor and Distinguished McKnight University Professor of Chemistry. Professor Stein is the recipient of several awards, including a Merck Professorship in Chemistry, a 3M Faculty Grant, a Dupont Young Professor Grant, an NSF CAREER Award, a McKnight Land-Grant Professorship, and a prestigious David & Lucile Packard Fellowship. He has been on the editorial advisory board for Chemistry of Materials and is currently on the advisory boards for Advanced Functional Materials and for Particles. He is listed among the Top 100 Materials Scientists (#27) for impact during 2000–2010 by Thomson Reuters and as Highly Cited Materials Scientist in Thomson Scientific’s ISIHighlyCited.com (2014). Professor Stein’s research interests are in the field of solid state chemistry, in particular porous materials and nanocomposites. His program has pioneered research on the compositional and structural control of templated mesoporous and macroporous sieves, nanoparticle shaping, open-framework structures, and polymer/inorganic nanocomposites. His research targets a wide range of applications, including membranes, solar thermal energy conversion, bioactive glasses, lithium ion batteries, ion-selective sensors, catalyst materials, polymer-clay nanocomposites, photonic crystal materials, and pigments.